This article was originally posted by Rosalyn Turner with our partners at the Australian Strategic Policy Institute (ASPI’s) The Strategist. The Australian government recently approved the acquisition of a fleet of US Navy Triton surveillance drones to patrol our oceans. Australia has mostly used Israeli drones to date, such as the Herons in Afghanistan. So as we dip our toes into the American UAV market, it’s worth taking note of a recent development that might be threatening US primacy in this area. While the Predator and Reaper laid the groundwork for the use of armed drones in warfare, a question remains about the survivability of the technology against modern air defences. 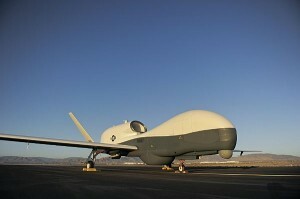 Developing a stealthy long-range drone with a decent weapons payload that could go beyond missions in Yemen and Pakistan appeared to be the next order of business for the US, especially in the future Asia-Pacific theatre. 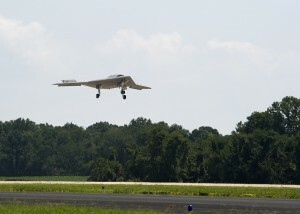 Projects like the demonstrator X-47B unmanned combat air vehicle (UCAV) have shown promise in achieving those missions. But for now the US Navy has decided to go for an unmanned carrier-launched surveillance and strike (UCLASS) system that won’t have the stealth or payload to penetrate air defences. The UCLASS system will be designed to provide Navy carriers with long-range surveillance and strike capabilities to target terrorists in much the same way as the Air Force’s drones are currently doing from bases around the world. The capacity to carry out those missions without relying on foreign bases is driving this decision, along with lower costs. But the UCLASS system will only operate over states that have limited air defences (because of UCLASS vulnerability) or have provided the US permission to conduct strikes. Al-Qaeda affiliates are on the rise in Syria, where the Assad regime is both hostile toward the US and has the capability to deny drones. This raises the question of how many states will fit this category. Consequently, at a program cost of US$3.7 billion, the UCLASS won’t provide the degree of innovation the 2014 Quadrennial Defense Review (PDF) advocated. This would be money better spent on more research and development (R&D) into a UCAV, which could potentially have greater impact in the future strategic environment. Moreover, the UCLASS would be mostly redundant in Asia, the most strategically important future region for the US. UCAVs, on the other hand, could have an impact in, for example, a future conflict with China. According to Mark Gunzinger and Bryan Clark at the Center for Strategic and Budgetary Assessments (CSBA), a UCAV with a range of 2,000kms, broadband stealth, a payload to rival the manned F-35C combat aircraft, and a capacity for aerial refuelling, is achievable. Developing a UCAV that’s survivable is no mean feat, but the US has a good start in terms of support systems and personnel established over the past few decades. UCAVs would be capable of rapid deployment from carriers, which could stay out of the range of anti-access threats. A persistent surveillance capability that could also strike vital command and control and air defence sites if required could open the way for follow-on operations by manned aircraft. A UCAV would form a valuable part of the US deep strike suite, a key feature of AirSea Battle (PDF). And while losing platforms is never good, drastically reducing risk to personnel is a major incentive, especially early on in a conflict. China’s an active player in drone development, and the PLA’s R&D investments are another good reason for the US to think carefully about holding off on UCAV development. China’s Sharp Sword UCAV, which was flight-tested in 2013, shows the PLA’s commitment to creating a mix of manned and unmanned combat aircraft. The growing Chinese defence budget (with a reported increase of a 12% this year) could lead to rapid advances in this area. Funding the UCAV is the big question considering the cuts to the US defence budget; its price-tag would be heftier than the UCLASS. 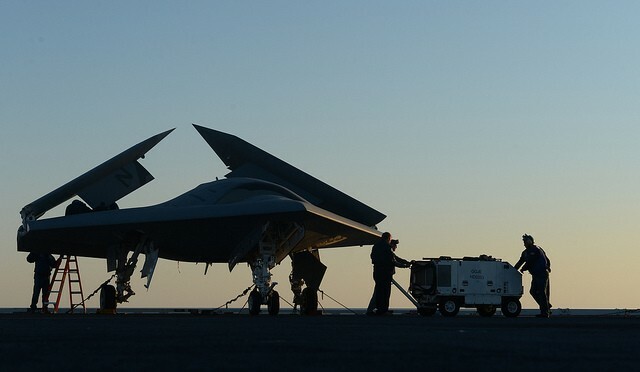 Proponents of the UCAV such as CSBA and the Center for New American Security (CNAS) (PDF), argue that the money could come from decommissioning two (or possibly more) carrier groups. 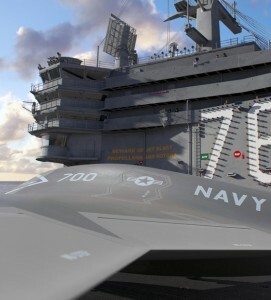 Budget pressures have already seen cuts and deferrals to the carrier force and it would be a big step to cut two more. What’s important in these perspectives, however, is that the UCAV’s stand-off capacity and flexibility could make each carrier more effective. As Michael O’Hanlon pointed out on The Strategist last month, capability should be the metric of adequacy, not dollars or hull numbers. The UCLASS could be redundant by the time it enters service in 2020, even in the targeted killing missions it’s designed to carry-out. A UCAV, on the other hand, would stretch the envelope in relation to advanced technologies, which would contribute to sustaining US strategic advantage. It would enhance a carrier group’s capability to respond to anti-access threats and it could also be versatile enough to respond to terror threats globally. Unmanned systems show no signs of fading into the background, and even in a tight fiscal environment represent a potentially high payoff for R&D funds. Rosalyn Turner is an intern at ASPI. Is the stealth worth it? Wired’s Danger Room has a good review of the contestants, and one similarity is worth noting. All but the Sea Avenger are of the “flying wing” variety, similar to the USAF’s B-2. This design confers some advantageous stealth properties through a reduced radar cross section, but comes at some cost of stability and handling. Instead, the Sea Avenger is essentially a souped-up version of General Atomic’s famous Predator drone. While Navy has yet to release the contract’s request for proposal (RFP), detailing the requirements and criteria by which the contenders will be judged, the NAVAIR website states the Navy is looking for an, “aircraft system providing persistent Intelligence, Surveillance, and Reconnaissance (ISR) and strike capabilities.” This closely matches the capabilities highlighted by the aforementioned companies’ websites. Demonstrating the future of carrier aviation, but can it be done cheap enough? With this, and with the shrinking range of carrier-based strike aircraft in general, in mind, the most attractive attributes will be stealth, range, mid-flight refueling (to further extend range), ISR capabilities, and the ability to carry stand-off weapons. By eliminating the weight and crew limitations of a strike aircraft, a UAV can greatly increase its range. But this does not eliminate the costs of crews, it merely shifts the crews’ location, tentatively increasing their safety and reducing some training and replacement costs. In fact, with extended ranges and increased ISR collection, each airframe may require more pilots and analysts than traditional manned craft. The current state of UAV technology will allow the military to demand many automated functions in the UCLASS including carrier landings, following flight plans, and executing pre-approved weapon strikes. Unlike drones like the predator, the UCLASS is expected to be able to follow flight plans, essentially executing its mission devoid of human input unless an emergency or unexpected situation arises, in a way similar to how tomahawks or other missiles execute their strike packages. Technology has its limitations however. UAVs are not yet designed to perform intercept missions, or air-to-air combat. They can conceivably be programmed to use counter-measures such as executing limited defensive maneuvering or deploying chaff in the event of a certain input, such as detecting an inbound enemy missile. Yet because the UCLASS won’t be shooting its way through high-threat environments, it will have to rely on either escorts (limited by their range), the distance of its stand-off weapons, or stealth. As pointed out at Information Dissemination by Rep. Randy Forbes, stealth can be quite expensive, and may have diminishing returns. The CNO also singled out the pursuit of stealth perfection as the potentially errant end of the cost-curve in an article in the U.S. Naval Institute’s Proceedings, “Payloads over Platforms,” widely (mis)perceived to be a critique of the F-35. In the context of the carrier battle, the single most important determinant beyond technological maturity may rightly be cost. To steal a common refrain from the debate over shipbuilding, quantity matters. Determining whether the ability to carry out deep penetration strikes far into an enemy’s territory will be better served by larger numbers of less-stealthy drones or a smaller number of super-stealthy drones will be an interesting exercise in analysis. That is until the drones are cleared for air-to-air combat, which could either be accomplished by human pilots taking temporary direct control, or eventually by programming the UAVs to fight themselves. Some final factors that will drive navies towards endowing their carrier drones more complete autonomy (see the writings of Adam Elkus for more on the ethical discussions surrounding such a move) are the vulnerabilities that satellite-based comms links with the UAVs will introduce, and the difficulty of maintaining and securing those links. While the players for the first big U.S. Navy UAV contract may be familiar, there is room for innovative new companies to capitalize on emerging technologies like 3D printing to cheaply create UAVs tailor-made to the requirements of the Navy. Without the risk of human casualties, being willing to accept the loss of a few less-costly drones for an overall increased strike capacity is a trade-off worth exploring.